Just one more list of places to check out, though most are already covered. 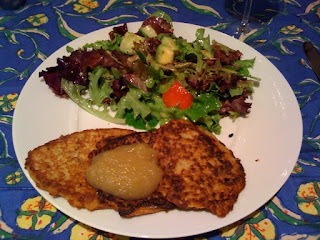 TOC "Most Monumental Restuarant Openings of the Decade"
Better late than never to celebrate hanukkah with home made latkes! What a great way to celebrate the end of the year, and decade for that matter, with a reliably satisfying meal at Wildfire. I was a little surprised to see a packed house on a tuesday night during the holidays, but then again, people always know where to find good food. Even though there was a very tempting three course meal option for $30 (great value), we opted to navigate the menu on our own. We started with baked goat cheese in tomato sauce (how very tapas of us) that was served with an interesting pita-like bread. No complaints, a great way to start the meal. For round two we decided to mix in some healthy greens in the form of a caesar salad for two. Very large serving, which we almost finished because I am always on the lookout for high end caesar salads. The dressing wasn't too heavy and the cheese didn't overpower. A nice dose of fresh pepper and I was very content. Now for the main course, I may have made a fatal flaw. Since the previous night I was at Hub 51 (notice any pattern with LEYE??) and ordered filet tacos, I had a taste for something that swims even though I know for certain that steaks at Wildfire are first rate. With that being said I ordered the special of the day, Crab Cake Crusted Trout served with wild rice and a mustard sauce. I should have ordered a steak (as my smarter girlfriend did). It wasn't a bad piece of fish and there were no major disasters, I just didn't want to eat the second half of the dish and could not find any real flavor to enjoy. The mustard sauce was too creamy for me to use which is unfortunate because I love mustard. The crab cake crust was interesting, something I don't think I have ever tasted before. There were bits of corn and red pepper in the mix, which worked well with the side of wild rice that also included corn and peas. The major problem though is that the fish did not have any flavor, period. Some of my first bites actually tasted a little fishy, and then as I kept going, lost everything all together. My eating partner agreed that it didn't taste like anyone. Odd, and better than tasting bad, but disappointing. The petite filet on the other side of the table looked and tasted wonderful. None was left to take home. Her side of mashed potatoes were also delicious, creamy and buttery just the way they should be. (I also used them to sample the BBQ sauce since we didn't order anything BBQ. One of my favorite sauces I have tasted yet...for future reference). With little room left our server tortured us with his dessert tray presentation. Even though I may have fumbled my entre this one time, I thoroughly enjoy Wildfire and can see why it is one of the most popular Chicago establishments. Great food with spot on service all combine for an enjoyable dining experience and all for a price that is more than justified (steaks for < $30). I think the "supper-club" idea should make a comeback, but until then I'll be eating at Wildfire. I went with a large group and ate very well, which is not surprising. We ordered plenty of starters, including three green bites, shakishaki tuna, guacamole, miso-glazed salmon roll and drinks a plenty. 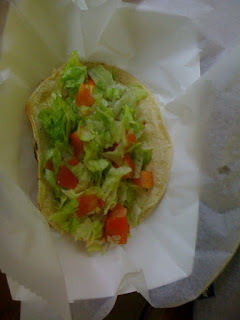 I love the tacos, and in the holiday spirit splurged a little and went with the filet tacos for the first time. They were so flavorful and tasty that I didn't even bother using the tortillas. I enjoyed my meat with the rice, beans, and salsa. Others in my group ordered short ribs, the filet, and THE DUDE (aka bone-in rib-eye). It was funny to hear my very masculine friend order "The Dude medium rare please." I didn't hear anything but praise from my fellow diners, which further underscores how impressive it is to have everything on the menu executed well with the diversity of options. And no dinner would be complete without a healthy serving of Martha's Carrot Cake. Hub is one of my favorite places to eat in the city. Pretty good Japanese, just don't expect a huge sushi menu. I really like their combo meals with soup, maki and ice cream. My favorite is any teriyaki combo, particularly the chicken and tempura. 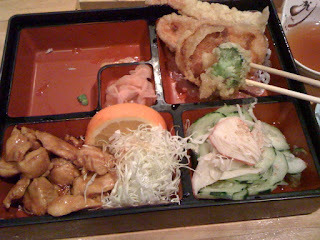 It comes with a tuna/avocado roll, tempura, chicken, cucumber salad and miso soup. It finishes a choice of ice cream. 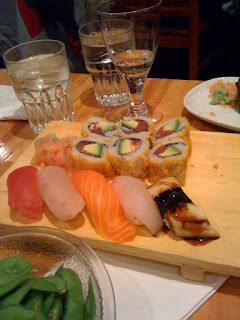 Again, good solid Japanese food, I'm just not impressed with sushi selection. 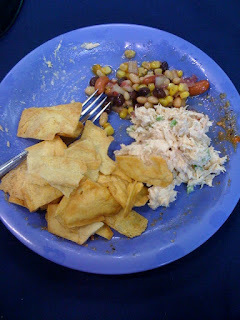 Good tuna salad and bean salad at oneg after the b'nai mitzvah on boxing day. Nothing says Merry Christmas at lunch like a quesadilla. Happy holidays to all. I guess the memo that Morton's Steakhouse was giving away free mini cheesburger from 5-6pm yesterday flew under the radar more than I would have expected. The bar area was full, but not from the likes of cheapskates like me looking for a deal. My friend and I were able to grab a table to sit at and enjoy a drink while we waiting for the servers to come around every 8 minutes or so with free mini burgers. I was surprised by the size and thickness of the mini. Plenty of meat and goodness to qualify as a "bite." We lasted 3 rounds, which was probably one round too many. My only complaint is that during "happy hour" times, everything off of their bar menu is only $5 (that's a good deal). Normally three mini burgers cost $13, but at this time of night they would only be $5 for the three. After careful calculation, our three rounds of free burgers really was only $10 worth of food. Now I might be getting greedy, but $10 of food wasn't really worth our time, especially when we paid $11.75 for a two-ounce pour of bourbon. Anyway, I'm not a scrooge and am appreciative of the free give away in honor of the 31st anniversary. The food is always tasty, check out that bar menu after work for some good deals. Wow my belly is full of interesting and complex flavors after my pilgrimage to Bill Kim's latest spot. I don't know too many chefs out there that can make you ponder how each bite was constructed yet be so compelled to keep going until there's nothing left. The menu only has a few options but I don't think that's a detractor. Having only ordered the meatball sandwich and the lemongrass chicken (there were two of us), I would be tempted to return to explore. The table next to us appeared to be well seasoned and ordered a handful of sides with the lone soup on the menu. Not a bad play call. 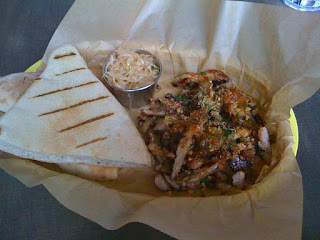 As for what I tasted, the lemongrass chicken was not your typical Asian offering. I wish I knew everything I was eating but some mysteries are best left unsolved. Needless to say I loved it and didn't share well. It came with two large pieces of bread that i probably was supposed to use to make a sandwich but didn't. Also included was a small side of cabbage with a vinegar based dressing. This was useful for cooling off the mouth as there was a nice helping of spice. My partner in crime went for the meatball sandwich that at first look reminded me of a falafill pita. It was served pita style stuffed with meatballs and cold noodles seasoned with magic. One bite of the noodle meatball bread concoction and I was hooked. If you haven't heard, the decor is as unique as the food. An open, warehouse feel with stools, communal tables and a grey steel feeling. It matches the setting directly under the train well. Check out the bathroom, I thought I walked into a SAW movie. It all works together though to enhance the overall concept. Lastly, since you order at the front counter and wait for your food at your seat, the initial bill surprised me. However, after eating the meal you realize you have a full belly of unique tasting delicious food. The bill seems appropriate and justified. I recommend checking out Belly Shack, even if it requires a pilgrimage. Joy's Noodle and Rice is the best Thai noodle shop I have found in Chicago yet. The fact that it is BYOB only adds to the appeal. There might be better gourmet Thai food restaurants, but for quick and cheap noodles, this takes the cake. I was with a party of 5, so we started with some group appetizers. We tried the dumplings, veggie roll and spring roll. The shrimp/pork dumplings were fine, nothing too crazy. Came with a interesting, mildly thick soy vinegar sauce. The spring roll was your typical thai spring roll, except this came with cream cheese inside. My personal preference is not to include a breakfast spread in sushi or thai rolls, but that is just me. 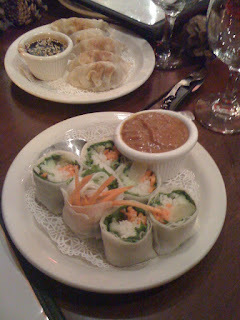 The veggie rolls were by far the best, served with a delicious warm peanut sauce (all rolls $4.50). The good starters led well into the main dishes. I had the spicy chili noodles with chicken ($7.50!!). Not the most complicated of flavors, but that's not why we go to good thai noodle shops. It was as good as I hoped, and filled me up quite well. Any room I had left I saved for the B part of BYOB. Everyone else I was with enjoyed their dish as well, and we were even more enthusiastic when we saw the bill. The menu is plenty big to keep you occupied for multiple visits. With a very high taste per dollar quotient, I think I will be returning to do just that. I had the venison dog. Very tasty. Nice place, fun idea. A little more pricey than your average dog house, but that's the point. Very very good Italian. Nice value good menu. We all ate pasta dishes and loved them. Can't speak to the others but I assume excellence. Highly reccomend and will return. Cool and fun atmosphere, started off with the pork and cilantro dumplings which were very tasty. We split a noodle dish and the short rib rice dish which were full of flavor. Would be a fun place for a small party or gathering. Gourmet fast-food it may not be, but they sure do serve a mean chili and shrimp taco. My friend alerted me to this new hole in the wall a day before I read about it in The Dish. We are always looking for good cheap eats and this fit the bill. The menu is simple, one side has the fish dishes while the other has meat options. The three of us patrons ordered fish & chips ($8), Chili bowl ($5) and a shrimp taco ($3). The report on the fish & chips was positive, I stole a french fry to confirm. I ordered the shrimp tacos and asked for a side of chili to taste. Boy, for $3+ I had some real tasty food. The chili was down right nasty good, full of beans, tomoato chunks, corn and meat. 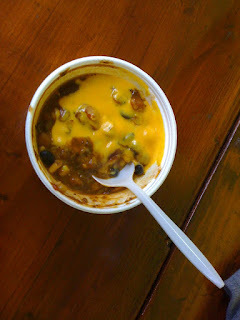 I'm a huge chili fan and this makes me want to go back for more. The nacho cheese topping added a little creative touch that I appreciated as well. Following the chili I attacked my shrimp taco with speed. The first thing I noticed was the light and zesty citrus sauce and lettuce topping. It really made the taco feel refreshing, even on a blustery freezing rain night in Chicago. After those two dishes you'd think I would be happy to leave with good food in the belly. Well I wasn't quite in the mood to leave yet so I turned around from the counter (the place has 8 stools for the counter and is 5ft wide) and ordered (per the suggestion from "BIG") the crab tostada ($4). I probably didn't need any more food but I wanted to give them business and try more items. What I really didn't need was the free course of fish tacos that "little" brought out for all of us to try. Unfortunately I needed the fish taco even less because I didn't think it was nearly as good as the shrimp. There was a nice topping of bright purple cabbage that made the dish more fun, but it also came with a lot of orange spicy tartar sauce that I could have done without. 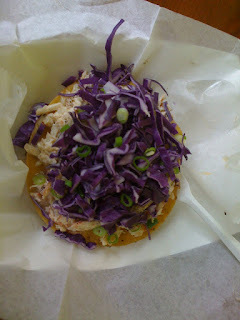 And then, after all of that food, my order of crab tostada arrived. Needless to say I wasn't hungry anymore, but I did my duty to explore the menu. Again, I should have stopped after the shrimp taco. The crab meat just didn't seem to have much flavor of anything. It looked like it was prepared well, but I couldn't taste it. At the end of the day, I would go back (though it isn't the easiest place to get to) and recommend other people check out this cool outpost from a former Hell's Kitchen contestant. I may not have loved the fish tacos or tostada, but the chili was amazing and the shrimp tacos are second to none. I would try the fish & chips, chili dog or anything else. Check it out for lunch if you are in the neighborhood, or grab something on the way home. If I did not mention earlier, the value is ridiculous. Other critics have said they charge too little and I'd have to agree. Go now before they realize, or go now for good food. Call me crazy but I wanted to check this place out before the door closed in two weeks time. My first thoughts after finishing my meal were some things in life just don't need to be "fused". As in I am a huge thai food lover, and I enjoy good French fare, but there is little need in my book for both on one plate. Don't get me wrong, their signature pad thai was quite delicious, and the drinks (@7.50) were fun and complimented the flavors well. 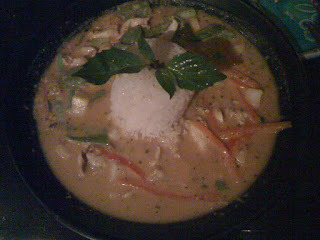 But at the end of the day the red curry (13.95) was missing something and the chicken Satay (6.95) (while well cooked and seasoned) didn't have the same peanut punch that I love. 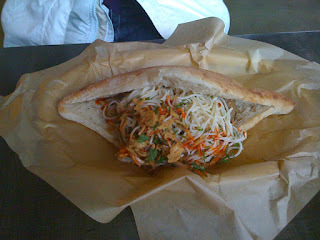 My least favortie dish was the VTK rocket roll (3 for 7.95), made of shrimp and pork. (maybe rocket in thai means anti kosher?). The shrimp was a little too fishy and the sauce didn't add anything. Our service was fine and the decor intriguing but nothing special. At the end of the day would I go back or recommend to friend? It doesn't matter since it's closing, but I will say they make a mean pad thai. I'd just go to my local thai shop for an entire meal. Since I have not yet made plans to bring in the new decade, I've been searching for ideas high and low. If anyone else is in the the same boat, I'll share with you 10 places to have dinner courtesy of Metromix. Although I just stumbled upon this, a choose your own adventure from Metromix to help decide your plans. I might play around for hours. Pretty neat. An authentic, Italian family style pizzeria in the heart of Lincoln Park that accomplishes the goal of light and tasty thin crust pizza. To be honest, we went for a quick early bite to get a taste of the place. The meal consisted of two pizzas and a caprese salad. The first thing that caught my attention with the food was the bread (served with the caprese). I don't know a lot of words to describe bread, but it was soft, salty/tasty, and lightly toasted. It was just yum and served as a good omen for the rest of the food (considering bread is a key ingredient). The caprese was uneventful, and if anything a little overpriced at 7.99 (I'm thinking 5.99). The two pizza's we ordered were the Parmigiano (12.99) and the special of the day Pizza Conadina (14.99). Without doubt the Parmigiano was the better dish, it consisted of Tomatoes, mozzarella, eggplant, shaved parmesan, basil and olive oil. 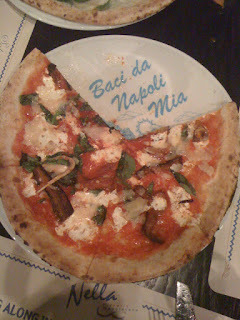 It was as good as it sounds, crisp on the outside but soft dough, great tasting tomato sauce and fresh eggplant, cheese and oil. How do we know the pizza sauce was so good? The second pizza (the special) didn't have any and it was obvious. The conadina had Italian salami, mini tomatoes, white cheese (not sure what) and arugula. It wasn't bad, but just lacked the same flavor as the other pizza, and the italian "salami" was more like overgrown pepperoni and a little undercooked in my opinion (I'm no expert on italian meats). And at $2 more than the parmigiano, I felt a little silly to say the least. Aside from the food, the decor was welcoming and the service attentive (maybe a little too much, but it was a slow). The space is surprising large, with a few sections divided throughout. 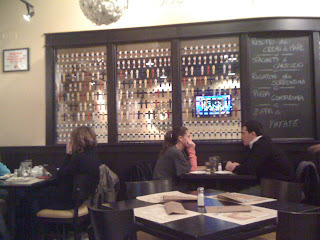 One wall was made out of foosball players (pretty funny), while there were two large TVs by the bar area. Light fixtures were made out of old wine glasses while large plant arrangements hung from the ceiling. However, the best part of the place I noticed is the large mirror hanging above the pizza preparation area that allows the customers watch their food from start to finish. In all the experience, while short and sweet, is something I would recommend and hope to return to try more items. Many families filed in as we were leaving and I suspect the place will do well (a second location is already in the works). This is a good bet for those looking for something other than "Chicago Style" and prefer thin crust "Italian" style. Congrats to The Bristol for making the list, and only Chicago restaurant to do so. Very good BBQ, authentic St. Louis style. Loved the sides, BBQ beans and mac and cheese. I prefer the pork to the brisket (against popular opinion) but everything tastes great drenched in the sauce. I was lucky enough to go on Saturday before a rush hit. Check it out if you like BBQ. UPDATE: The only other things I would add to my experience is that my friend was a little surprised at the location/appearance of the place. I wasn't too shocked, especially when compared to other "BBQ Shack" places, but yes, we did drive past it before we noticed the little black awning that signaled we had arrived. The prices on everything seemed quite reasonable and would not say I left there hungry. The platter dishes (helping of meat with no bread) comes with two sides for $11 (incl. tax), and sandwiches (including one side) just a couple dollars cheaper. They also appear to have a robust catering organization if you needed another option for feeding the masses. If the #2 ranking on Urbanspoon for Chicago restaurants doesn't say it already, the line out the door at 2pm on a Saturday should be enough reason to check it out. Interesting place, very trendy (too much imported from NYC?) 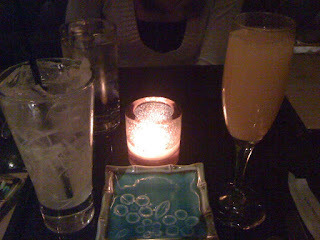 with well made drinks and pretty tasty food. I went for "daisy hour" (happy hour 5-7pm daily) which has discounted margaritas and a handful (i.e. 4 choices for < $3.5) of appetizers. Details can be found here. The decor is fun and interesting, putting you in the mood to drink and share food. My friend first noticed that they seemed to have put as many tables as possible in this relatively small space. Maybe they want you to share the food with the people next to you? At the bar enjoying our "daisy hour," we tried all four of the available dishes and ended up really enjoying the shrimp quesadilla and the Chicken barbacoa flauta. The other two (Organic steak picada and Mushroom tostada) were only ok. I'm not a huge mushroom person so my opinion might be skewed. The steak picada comes with plenty meat (I'm confident I had never seen a picada before), but the flavor must have been left in the kitchen especially when compared with the flauta and quesadilla. I'd say the biggest surprise was that at 5:30-6 on a Friday evening it seemed the place was still not organized and ready to go. There were servers standing by the bar memorizing the menu and bar aides preparing drink mixers. Again, I was more surprised than anything else that it felt a little out of control at 6pm on a Friday. So much for the "calm" before the storm. Since I had seat at the bar enjoying my food and drink it didn't really bother me. In the end I was happy with my experience and would recommend it to a friend, I just don't think I'll be running back for food outside of their "daisy hour." P.S. For dessert fans, the Caramel Flan made the list of Best Desserts of 2009 by Time Out Chicago. I think the new menu is an upgrade. The decor is cool and the service great. Interesting menu choices, with the entrees being the weak link. (Reading the menu took an explanation. Two sections of starters, one salad section, two flat breads and the entrees.) We enjoyed the flat bread (best thing we ate that night) and cheese plate (comes with 4 cheeses presented very well with large baked bread and served with a cranberry chutney and apple butter), even if the cheese plate was at the bottom of the menu designed for post meal enjoyment. Their cocktail menu is impressive, and not all that pricey. Apparently the whisky drink I ordered is best served in a martini glass (I went with beer for round 2). The roast chicken was flavorful but I did not enjoy the brussel sprouts served in a cider jus. For some reason it just tasted very pungent. I enjoyed the scallop appetizer (my main dish after consuming lots of flat bread and cheese to start) dish with pumpkin risotto, served with two well cooked and seasoned scallops. Finally my other friend ordered the burger said it was was spot on (I think he won the order award for main course). My only slight gripe was value. A two course meal (2.5?) with drinks adds up quickly. I would say I would recommend this place as a good neighborhood spot where I would sit at the bar and drink with a few small dishes. At the end of the day though, it is definitely more fun than going to the library. 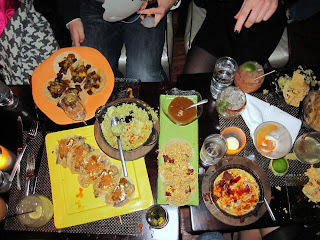 Not too surprising to give an enthusiastic thumbs up to a Rick Bayless spot. I went after work Friday, so no lines, a huge bonus. The menu is both simple in its presentation, but appropriately complicated with the items served. I wanted to warm up from the bitter cold so I optioned for an authentic hot chocolate made with real chocolate + water only. Strong flavor, not for the faint of heart or anyone not in love with chocolate. Definitely not what most Americans are used to but give it a try for chocolate fans, just don't ask for whip cream on top. As for the main course, I opted for the Milanesa torta and was that a great choice. Crispy chicken (think fried breaded goodness NOT from KFC) with Jack cheese, avocado salsa, jalapenos and black beans. Yes, it tasted as good as it sounds. My friend had the vegetable soup, enjoyed it without much fanfare. I think I won the order battle (does anyone else play this game?). Also, don't fret about leaving hungry, the portions are plenty and leave room for dessert (something I'll have to do next time). I recommend checking out this new hot spot (especially with no lines) and as an other urbanspooner put it, $9 is a steal for flavorful dishes from a world class Chef Bayless. P.S. 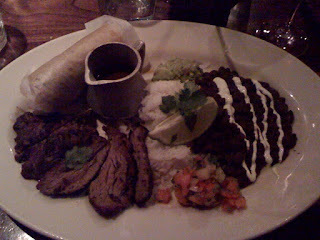 The Barcelona Hot Chocoalte and the Carnitas Caldo both made TOC 2009 Best Dish List. Entire list is here. I don't need to say much as many more talented reviews have done that job for me. First and foremost the food tastes great and is not overly complicated. The squash soup and crab cake starters were fantastic. The desert menu looked amazing but we only chose one, the peanut banana crisp thing. Awesome. The main course was a fish dish that I can't remember because it was not on the menu, but the highlight was my girlfriend's pork tenderloin. Perfectly cooked and melt in your mouth flavor. Not surprising a good meal and lived up to expectations. Given what I had read about the place, the awards won and recommendations by friends, I was surprised that our server said that even after 11 years the place is still not well known. They would be doing better in this economic climate with a stronger loyal customer base, but such as it is the doors are open for Suzie to serve quality food and I hope for years to come. It's a perfect date place with a dark, quiet setting. If times were different you could go there more often. 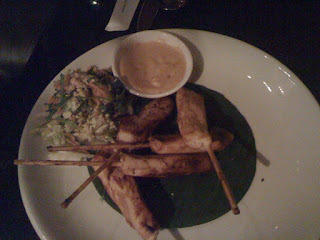 Such as it is, the menu is not cheap, but the food is worth it if you are willing to splurge (think $$$$=entrees > $25). Enjoy. P.S. A great deal is their 3-course $35 Prix Fixe option M-F 5-7pm, S 5-6pm. Something I would go back for in a heartbeat. Awesome awesome awesome. Great menu great food good drinks and fun atmosphere. Nothing much else needed. Add this to your tapas list, or make it THE list. An absolute staple to an evening out. Party, drink or dance, you can do it all with class. Menu is perfect for small sharable bites or order hearty for a meal. After food head downstairs for sub 51. Enjoy, anything but will be hard to achieve. I hate to give a thumbs down because the food is not "bad" and the decor is impressive, but at the end of the day I don't think I would go back anytime soon, especially on my dollar. We tried lots of dishes, ravioli, mussels, scallops, trout, risotto etc. I think the first problem was that no one came away blown away. Lots of interesting flavors and textures. I loved the pumpkin purée that accompanied the scallops, but I didn't live the scallops themselves. The trout eaters were not prepared for the full fish presentation and preferred the fried green tomatoes on the side. Anyway, not a bad experience by any means, but for the money I would go somewhere else. Yes, all the hype and good reviews are true. Great food for good value AND byob. 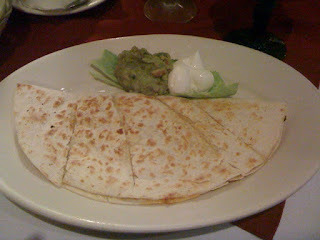 Loved the mole, the fish tacos, guacamole and choc brownie dessert. I could go on but I'll just say go try it for yourself. Living the area I had to check out the new place in a great location. Everyone I went with was impressed with most aspects of the place and plan a return trip. I think there are a few opening week kinks to work out but that's not unexpected. We enjoyed the burgers, very tasty and flavorful. #1, #12 and #8 were all tried. Loved the beer/spirits list (absinthe!! ), fries were up to standard (didn't care for the truffle oil mayo but that's just me) and the deserts topped off the evening perfectly (MUST try the ice cream sandwich). The value is good, just don't expect McDonald's pricing, but you get what you pay for no doubt. Look forward to making frequent trips. UPDATE: I wasn't the only one who liked the ice cream sandwich. It made TOC's Best Dessert of 2009 list. The idea is pretty simple, to report on my food experiences from places I eat. I will start by posting experiences from the past month and will continue forward. Hope I can provide some dining insight and recommendations for good eats.